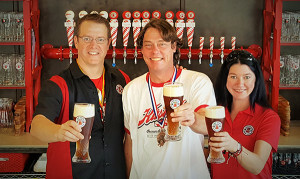 Tag Archive | "Great American Beer Festival"
Cedar Springs brewing staff includes (from L to R): Director of Happiness, David Ringler; Benevolent Overlord of Brewing, Matt Peterson; and Fräulein Brewster, Manda Geiger. It’s been a banner year for the Cedar Springs Brewing Company, the restaurant and brewery that opened in November 2015 and continues to win accolades from loyal customers and critics alike. In May, customers voted it the best brewery in West Michigan. In June/July, customers nominated them for their fried chicken and MLive visited and named them as one of the best (#11 out of 52) in their search for Michigan’s best fried chicken, calling it absolutely delicious. 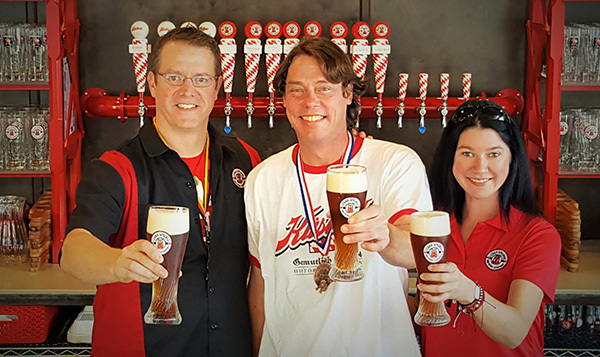 In October, the brewery’s Küsterer Original Weissbier was the recipient of the bronze medal in the “South German Wheat Ale” category at the 2016 Great American Beer Festival, held in Denver, Colorado.